I should've seen this coming. When I decided to check out the Lose It!! 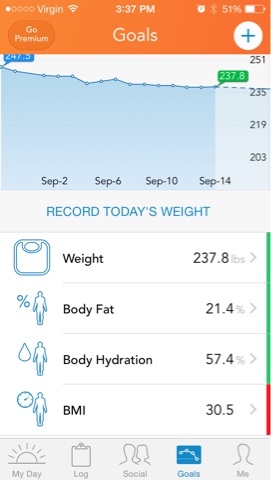 app, I figured I'd be content with just weighing myself, tracking calories, and seeing what happened. I wouldn't be seduced by other offers, or other technology… especially not some tricked-out Bluetooth data sharing scale. Not me. Oh no. Oh, who am I kidding?! Yes, I am now the proud owner of a LoseIt! Health-o-meter. Well, the proud part I might have to work on, but I most certainly now own one ;). The intrigue factor overcame the slightly creeped out factor. Yes, I admit it, the thought that my smart phone can get all sorts of information from a scale, store it, analyze it and give me advice about it just seems a bit... odd, but the "oh wow, how cool is that?!" aspect ultimately won out in the end. So how exactly does this work? 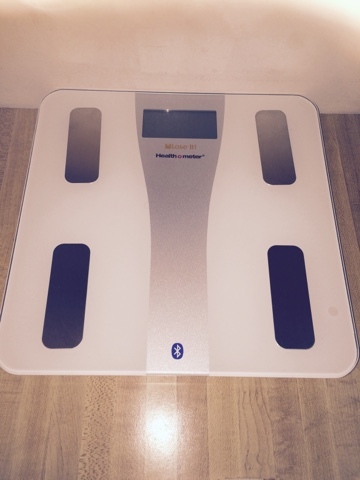 The scale uses Bluetooth to interface with a smart phone (iPhone in this case), and specifically with the LoseIt! app. Part of me considers that a little bit of a letdown, because it is a dedicated device for a dedicated app. Still, the ability to gather data, crunch it, and do something interesting with it always brings a smile to my face. What doesn't bring a smile to my face, however, is the level of precision that I can now be provided. Prior to today, I was content to have a scale that rounded in half pounds. Now I have a scale that is accurate to a 10th of a pound. But wait, there's more! I can now also get a reading (through the electrical impedance pads) of my overall hydration levels, my body fat percentage, and my body mass index (BMI). I used to take comfort in the fact that these were nebulous numbers; they just existed in the ether someplace and, oh, they might be derived through some inconsistent formula on a web site some place or another. Now, I know what they are… in vivid, gory detail. Yep, there it is… I can't pretend it's something else any longer (LOL!). Now, to be frank, there's a lot of ambiguity to these numbers even as they're presented. How precise are these values, really? They may be accurate, they may be off. However, for what I am planning to do, they're a good enough heuristic (i.e. rule of thumb) to be useful. I'm not really doing anything (competitive sports, bodybuilding, etc.) where they have to be super precise. They just need to do one thing… trend downward over time. On a technical level, the set up is simple; go into the app, pair it with the health-o-meter, press a button on the underside of the scale to pair the devices, create a scale profile for yourself, step on (barefoot, of course), let it get your measurements, transfer data, and then it is there in the app, ready to be logged and sync'd with the app's other algorithms. Each day you weigh in, the pairing profile does the rest. The scale itself feels fairly sturdy. For a day-one comparison, it does the job well. This product pairing fills me with equal parts dread and wonder. I'm weirded out by the level of detail it provides, and the fact that my phone can carry this and share it with a whole bunch of different apps. On the other hand, I'm super intrigued to see if this level of granularity and focus with the data will make me more efficient, or more aggressive, when it comes to weight loss, nutrition and exercise. I guess you'll have to stay tuned for that latter part ;).